Technical Technical Articles What is a Car subscription and how does it work? A car subscription model works by offering vehicles to customers by a subscribe method, meaning a customer can subscribe to a particular car for a certain duration and change it whenever it feels so, the customer wont be liable to do the maintenance of the car the subscription provider takes care of everything except for the refueling of the car. This gives customer freedom from putting efforts in maintaining a car, high purchase cost, and allows to switch the cars whenever he feels bored of it. Customers usually don’t get new vehicles usually they have a certain mileage already done but they will be fit for the road and drive. An interesting trend has taken hold of the society. Until recently, your only options with vehicle ownership were to purchase the car at a time or to lease it from a dealership. But in an increasing number of metropolitan areas, a third option is emerging: car subscriptions. This not only gives the customer peace of mind but also a chance of having a car for a limited time. Volvo is the newest to start using a subscription model. At the Los Angeles Auto Show this week, the company announced that it’s upcoming XC40 compact SUV would start at a $600 per month subscription with a two-year contract. Which raises the question: Isn’t this just the same as leasing a car? In some ways, yes but not exactly. When you lease a car, you pay a monthly sum to rent that vehicle until your lease term expires. It can be a rational option when you don’t have the cash necessary for a heavy car down payment. A lease can let you drive a car you might not otherwise be able to afford. You, the driver, still have to handle getting your own auto insurance and preserving the vehicle. It’s usually under warranty throughout the whole lease period. Ford, Porsche, Cadillac, and now Volvo are among the car makers giving drivers the preference of a subscription. The biggest difference is the time frame: Rather than being tied to a years’ long lease, subscriptions give you the ability to ‘own’ a car on a month-to-month basis. You could supposedly not have a car for 10 months of the year when you’re working and using public transit and then get a car subscription for two months when you’ll be traveling more often. These subscription plans comprise of insurance, saving the time and headache of hunting for a policy yourself. Also unlike a lease: You may not have the option to buy your car at the end of your term. Car subscription vs. used-car buying:Let’s say you use Ford’s Canvas service to get a 2015 Ford Escape in the Titanium trim level with 15,000 annual miles, or 1,250 miles a month. If you signed up for a single month of service, that month would cost you $880. If you opted for a longer subscription, the price would drop. If you agreed to a six-month commitment, for example, your monthly payment would dip to $592. Commit to a full year, and the payment would go down to $555. Unlimited miles could be had for an additional $40 per month. To buy a comparable certified pre-owned Escape with a 60-month, zero-down loan, you would pay about $425 a month. Insurance would be about $240 per month, for a total of $665. Let’s say you subscribe to Book by Cadillac and choose the Escalade. You pay $1,800 a month, plus a one-time $500 fee. You get 2,000 miles a month and can switch cars in the Book by Cadillac fleet up to 18 times a year. To lease a 2018 Cadillac Escalade with $500 as the startup cost, including taxes and the upcharge for the same mileage as Book by Cadillac, you’d pay $1,600 a month. Our insurance quote was about $375 a month, for a total monthly cost of $1,975. If you wanted a sports car comparable to a CTS-V for a special weekend, it would cost you $150 or more a day to rent one. What can possibly interest you in a Car Subscription Service? Convenience- Most let you set up the subscription online and manage it via a smartphone app. The company usually delivers the car to you. Flexibility- You can change cars more frequently than with leasing or buying. Potential cost savings- There are no down payments or financing charges. No negotiating- The fees are set. Less commitment- Some subscription services can be for as short as a month. Some shoppers with damaged or light credit may find it easier to be accepted into a subscription service than getting approved for a traditional finance contract or lease program. Ford’s car subscription service is called Canvas. On its website, it sketches out the car subscription process. First, you choose a car, in its case, a pre-owned vehicle less than three years old and then you choose a monthly mileage package ranging from 500 miles to unlimited. Supplementary miles add to your monthly subscription cost, but like some smartphone data plans, if you don’t use all the miles you paid for, they’ll roll over to the next month. From there, you schedule a delivery, and the car arrives with everything else included registration, warranty, insurance, roadside assistance, and maintenance. At the end of each month, you can renew your subscription or return the vehicle. Porsche and Cadillac offer comparable deals. The Porsche Passport lets you choose among eight car models (including the 718 Boxster and 718 Cayman S) for $2,000 per month or choose from 22 different Porsche models for a $3,000 subscription. With Porsche Passport, you can switch cars as often as you choose. Cadillac’s subscription service, which comes in at $1,800 per month, lets you swap between cars as often as 18 times per year. Volvo’s just-announced plan, ‘Care By Volvo’ which is more constrained than these versions but it’s also cheaper. You can only subscribe to the XC40 Momentum SUV, it’s a $600 flat rate (unless you want a higher end XC40 model, in which case it’s $700 a month), and—more like a lease, you’ve got to hold onto the car for two years. Nevertheless, it does come with roadside assistance, factory-scheduled maintenance, “wear and tear” replacements on commonly replaced components like windshield wiper blades, and Liberty Mutual auto insurance. Volvo, unlike many of its competitors, does give subscribers the option to buy their vehicle at the end of their subscription. There’s one more big difference between many of these new car subscription services and leasing a vehicle and that is, Availability. Cadillac’s BOOK service is only in New York City, Dallas, and Los Angeles; Porsche’s program is based in Atlanta; and Ford’s Canvas program is only in San Francisco and western Los Angeles. Volvo’s subscription service, nevertheless, will be available nationwide when it debuts next year. 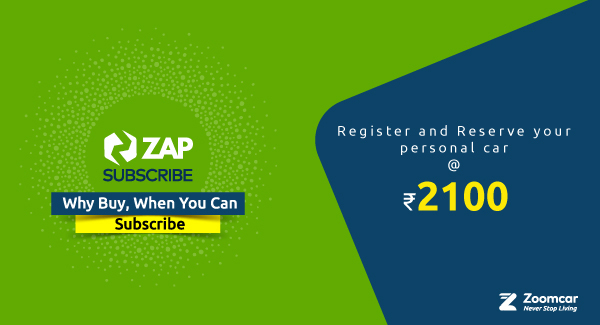 Car Subscription in India has also started with Zoom Car’s “Zap Subscribe”, which enable customers to subscribe to cars at a fixed monthly price. With this service the customers are able to subscribe a car at a fixed amount, it can be subscribed to a fixed duration of 6, 12, 18 and 24 Months. 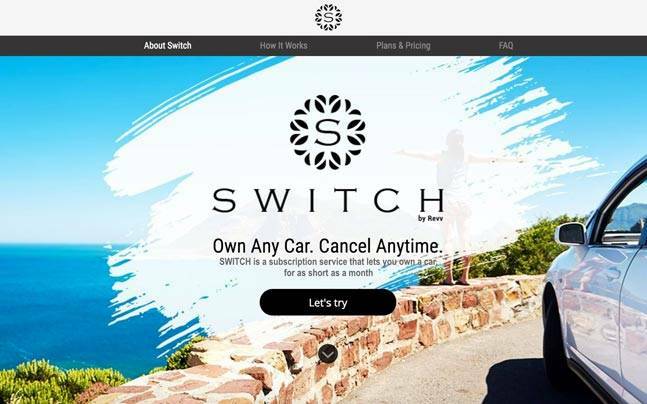 Switch by Revv: This service allows to subscribe a car for a minimum of a month, the price starts from 17500 for Hyundai Eon to 55000 for Mahindra XUV500. Looking at costs over the long run, it’s possible that the car makers who will win out in the end if the idea of car subscriptions catches on as fast as other mobile subscriptions have. These car subscription services seem like an outstanding way to streamline the car ownership experience. It’s essentially an all-inclusive lease, but with less commitment and that seems absolutely logical.